The Urban Politico: And the Winner is ......... 12-Years a Slave! How do we counter ignorance like this?? We bring these stories to light in an intellectual, dignified and respectful manner. Yes, the moron in the movie probably won't see these movies, but someone else will and could potentially educate him on his ignorance. I'm usually against movies like this, because Hollywood has a weird way of glorifying these types of movies to the point of rewarding an embarrassment. However, 12-Years a Slave was perfectly made, promoted and rewarded. Our stories need to be told. It shouldn't take a British director by the way of Brad Pitt, to bring such an important American story to the our screens. I don't expect 12-Years a Slave to be the pixie dust that changes everything and gets Hollywood to focus on black film makers, actors and actresses. However, I do expect the conversation to expand and more film makers be given the opportunity to make important historical films with deep subject matters. 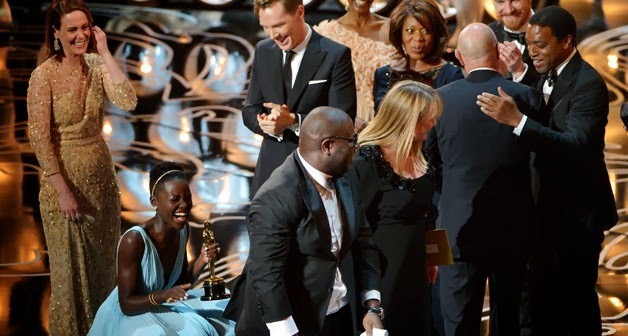 1) Did you watch the 86th Academy Awards last evening? if so, what were your thoughts on the show? 2) Were you surprised that 12-Years a Slave did so well? 3) Were you familiar with Solomon Northup or his autobiography? 4) What does the success of this film mean for American black film makers?